Former couple Ariana Grande and Ricky Alvarez have been have hanging out a lot lately. And they’re about to be spending even more time together because based off a very suspicious Instagram comment, it seems like the dancer might be joining the “Thank U, Next” singer on tour! Rumors started spreading after the 26-year-old attended the singer’s release party for her new song “7 Rings” on Saturday, January 19, 2019. Ricky shared a snap from the party, where he posed with the 25-year-old and her photographer, Alfredo Flores. “Woo,” he captioned the shot. 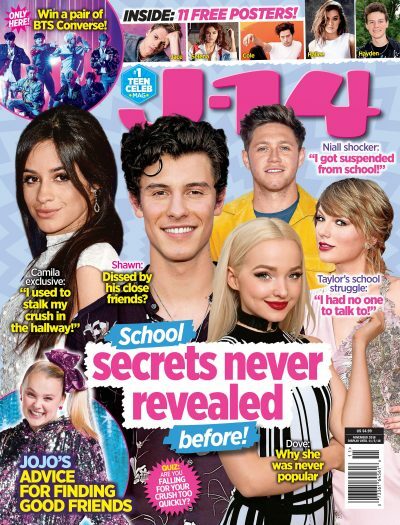 As J-14 readers know, the former couple actually met and fell for each other when Ricky was performing as the her backup dancer on her 2015 Honeymoon Tour. But in 2016, the couple mysteriously called it quits without an explanation. Now, almost three years later, the two have been spending a lot of time together again. Besides hanging out at the “7 Rings” party, they were also spotted spending the day together in New York City at the beginning of the month. And get this — Ricky even photographed Ariana for a recent photoshoot! The two first rekindled their friendship right around the time that Ari released “Thank U, Next,” which even has a line about the dancer. After it came out the two had a super cute interaction on Instagram Stories, where he shared his reaction to the song and Ari reposted it. So what’s going on between her and the 26-year-old you ask? Well, before you freak out, remember that Ricky is a professional photographer and dancer, so it’s most-likely that he’s joining the brunette beauty for work, and not because they’re back together. Plus, the 25-year-old actually cleared up the rumors that anything was going on between them, when she replied to a fan on Instagram last month. “We’re friends everyone take a big ol’ breather,” she wrote. OK, we seriously love that they’ve been able to stay friends through everything. But you know what they say — history tends to repeat itself! Maybe they’ll fall for each other again this tour… Guess we’ll have to wait and see!